No amount of careful preparation can protect against damage like this, and we woke up to find that a huge piece of our largest tree had come down. 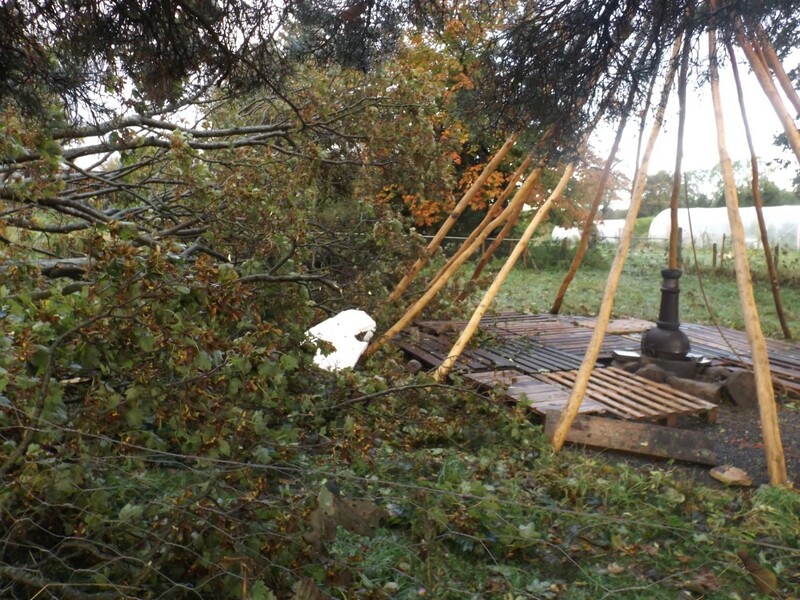 Amazingly it missed both chicken houses, and the tipi poles, but our poor tree is looking rather sorry this morning, as it has a huge gap in one side. 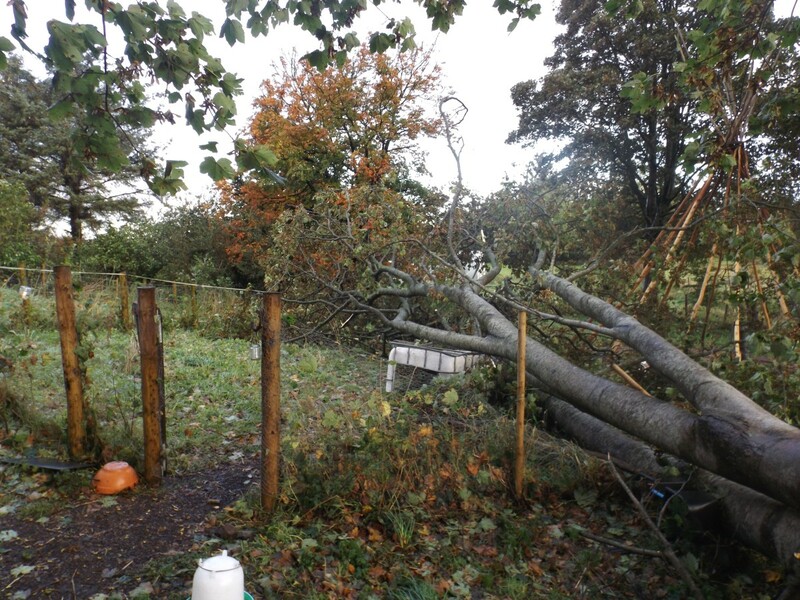 Thankfully other than a torn polytunnel door, we don’t have any other damage. We’ll certainly not be short of firewood in 2 winters time, but this was such a lovely tree, and now I think we’ll have to get it looked at, as its very one sided, and the one remaining side is right above the stables..
A close shave. Other than crushing the hen shelter, its amazing that the tree missed everything. 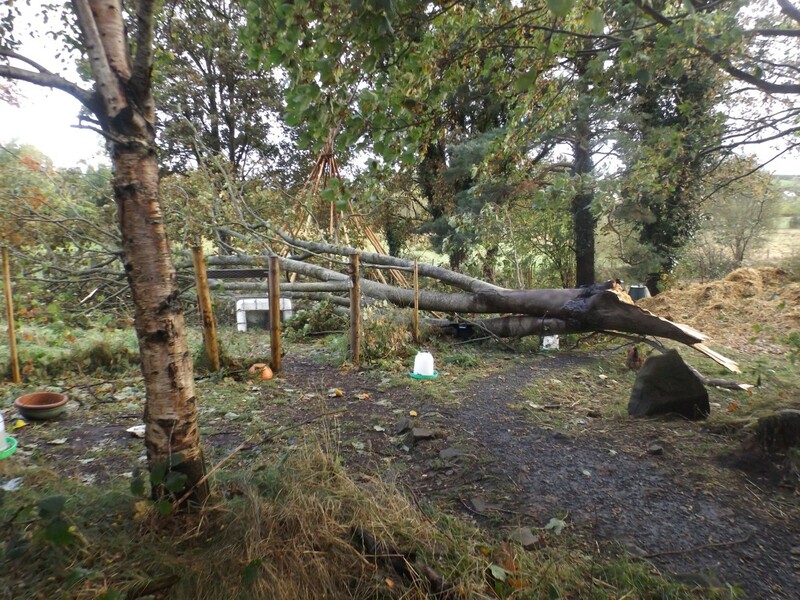 I’m sorry for your poor tree and hen shelter, but so glad it wasn’t worse. I hope the tree can be saved. If it’s over the stables and the wind takes it out that could be huge issue. At least if you have to take it out you will have more good fire wood. We lost nothing but some leaves and tiny twiggy kind of branches. It sounds like you guys got hit worse. We do have about 4 inches of standing water in our back field. The freshly cleared drainage ditches are indeed draining. As is our newly found clay drainage pipe! when they cleared the ditches they found some old terra cotta drainage pipes that were clogged. a little clearing and they are working pretty well! Not bad for a system that is at the youngest about 20 years old and probably older. I’m glad you are all safe! Be great if you can put us in touch Catherine. I’ve no intention of taking it out altogether, the most we will do is lower the canopy to where the now smaller side is, maybe 20 feet off the top. Its our favourite tree, and the rest of it is (I think) healthy, so we just need to balance it up a bit. this was a big storm…stay safe….